Today is Part 3 of Kimi and Scott’s rustic, Emerald Lake Lodge wedding! We had the best time working with this fun-loving, amazing couple on their wedding. This wedding was everything a wedding should be; fun, intimate, personal and filled with love! Thank you so much Kimi and Scott for allowing us to be part of your special day! We wish you much love and happiness! Here’s some more details! To see more of their wedding, you can view Love in the Rockies Part 1 here and Part two here. For table numbers, Kimi and Scott used various mountain peaks and resorts from races, training areas and mountains they have enjoyed together for table numbers (including Whistler, BC which is where Kimi competed in the 2010 Olympics for Canada in snowboarding while Scott cheered her on with a 4′ Go Kimi” sign). We engraved each table number with a note about why each mountain was important to them. We made a wood seating chart for Kimi and Scott so guests could find their seats as well as wood veneer place cards with hand drawn snowboard elements. I love Kimi and Scott’s cake and cupcake display and I especially loved their cake topper which Kimi had custom made for them. The topper had skis for Scott (his sport of choice) and a snowboard for Kimi. We made a few small fun details such as felt Mr. and Mrs. signs as well as fun signs for the washrooms. One of Kimi and Scott’s favorite treat food is popcorn so it was a perfect favor. Kimi and Scott arranged to have the popcorn delivered to each guest room upon their arrival. Kimi had cute labels (from wedding chicks) printed up for each of the mason jars. For more information on our wedding planning and design services at Emerald Lake Lodge, contact Naturally Chic at www.naturallychic.ca, info@naturallychic.ca or 1.888.679.9056. We look forward to hearing from you! We are so thrilled that this rustic emerald lake wedding that we planned and designed with our amazing couple Kimi and Scott is featured in the Weddings in Alberta magazine! 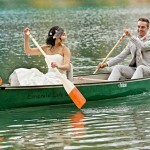 Stay tuned tomorrow as we will be blogging about our experience working on this wonderful Emerald Lake Lodge wedding! We have lots more details to share! For more information about our planning and design services at Emerald Lake and in the Rocky Mountains, contact us at 1.888.679.9056 or info@naturallychic.ca (www.naturallychic.ca), or visit our sister site Canadian Mountain Chic for more inspiration. I was absolutely thrilled to see my Inspirational Winter Shoot featured on the ultimate wedding blog Style Me Pretty yesterday. I was so busy yesterday that I didn’t even have a chance to see the post until late in the evening. It was a wonderful way to end the evening! Thank you, Style Me Pretty! If you missed, you can find the post on Style Me Pretty here. Here are a few of my favorite photographs from the shoot featured on SMP. Here’s our original posting of the shoot on our blog. And of course Suzanne + Nick the fabulous models! We love to hear from you if you are planning a wedding at Emerald Lake Lodge or anywhere in the Canadian Rocky Mountains!